So the week flew by in a blur. 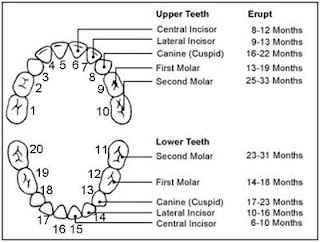 Some big achievements on my part include the fact that I'm getting my 2nd bottom tooth in, as well as at least one (maybe two) top teeth. 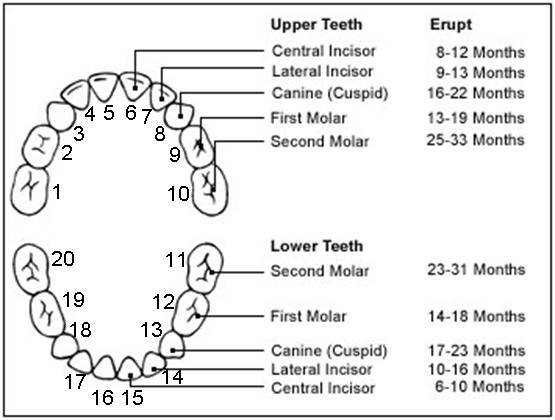 So to date, I've got tooth # 16 (see diagram) and now have 15, 4 and 7 peeping in. In addition to more teeth, I'm now eating big kid school lunches. I get a real menu sent home with me and I eat small bits of stuff like turkey and cheese sandwiches, pasta and sauce, and my favorite...chicken nuggets (of coure who doesn't love chicken nuggets but maybe Nazis). Another highlight of the week was getting to take a bath with mom! Fun times and I can't wait for swim lessons to start and weekend trips to the lake! On Saturday, I went out to visit my "relatives" from Thailand again. Na Peng gave me a bottle and Pa Ead laughed at me and played games with me and cousin Pierce! Then for the Pièce de Résistance...we threw a welcome home party for Uncle Dave! Lot's of dad's friends dropped by and held me. I got to see mom's old roommate Brad, Evan and Emmerson, and even Jeremy and Kelli. The best part of the night was Uncle Dave telling stories about Djibouti while Caroline fed me a bottle. Here I am perfecting my crawl.